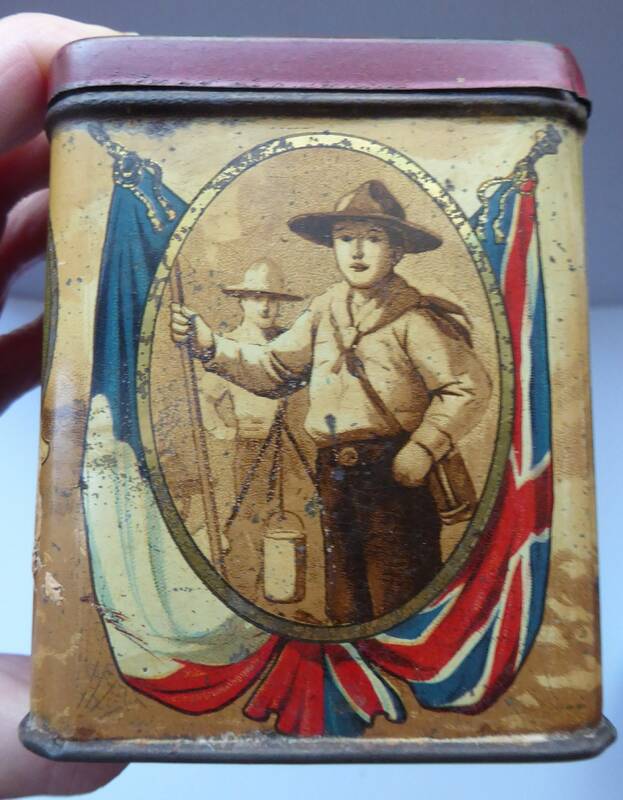 This is a harder to find antique tin - made as a commemorative piece dating to the beginning of the Great War - so about 1914 in date. It shows events, characters and people involved in the early conflicts of World War One. It would have originally been made to hold tea leaves inside it - and would probably have been produced by a company like Ridgway. 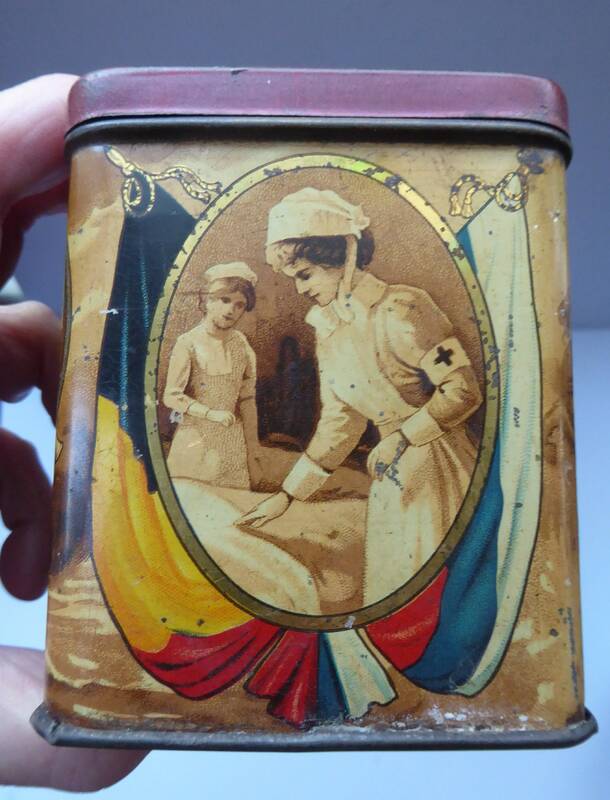 Obviously - this old tin has some condition issues - commensurate with age and use - so let me give you an in-depth condition report. 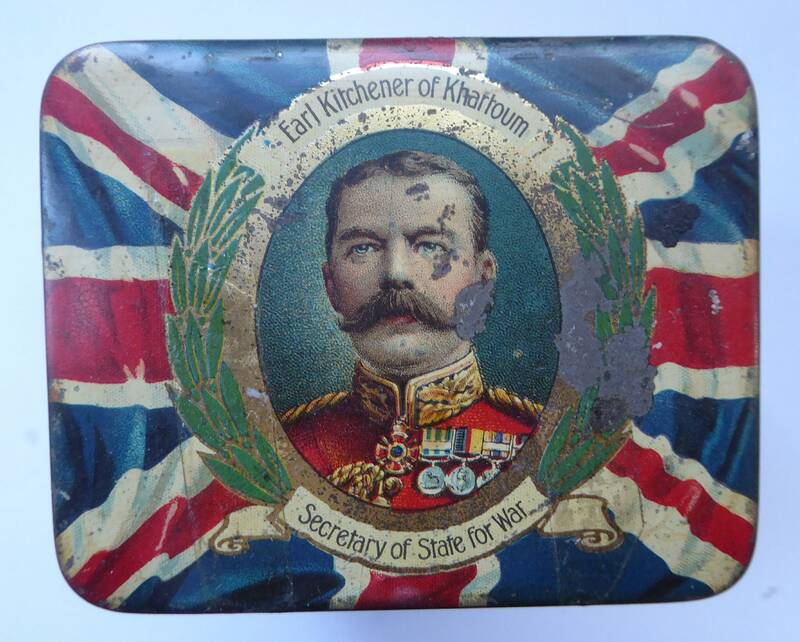 The lid features a portrait of Earl Kitchener of Khartoum - he is in a medallion with laurel wreaths to each side and behind is a Union Jack. There are some little losses to the decoration - a wee scuff to Kitchener's face and to the right-hand side laurel wreath - but not too disfiguring. 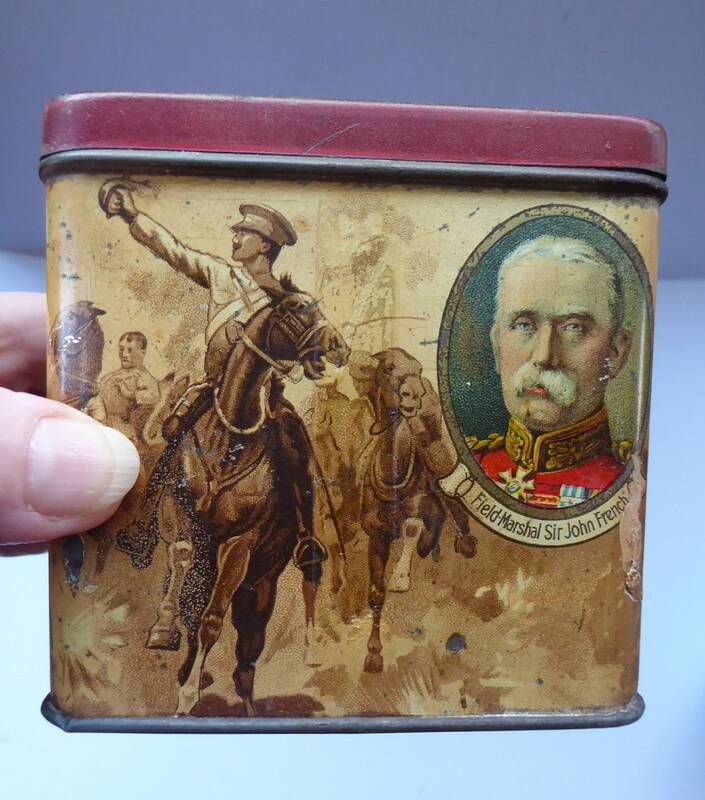 Please also see my interesting Staffordshire Figurine showing Lord Kitchener on horseback. 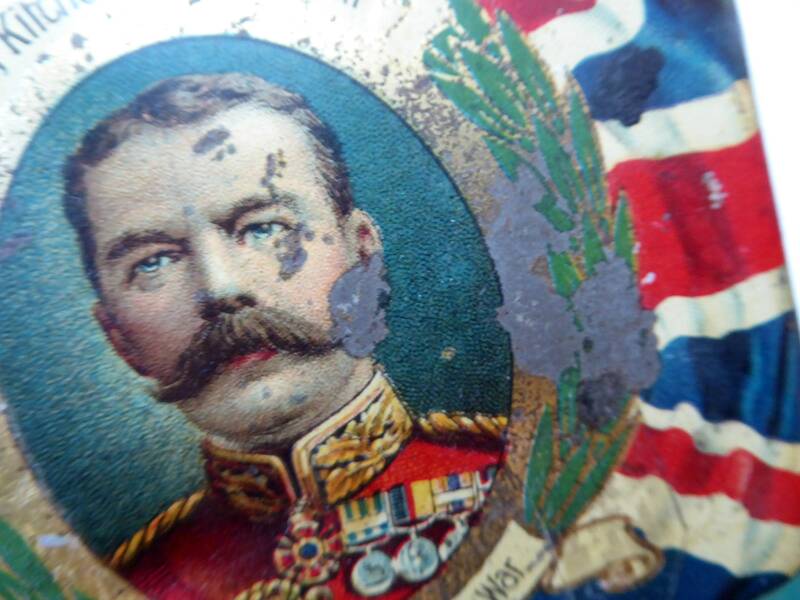 To the sides we have - on the front - another portrait medallion of Field Marshall Sir John French. There is a cavalry charge and interestingly some charging camels also in the background. The image is in pretty good condition with no major losses. There is an old hard residue of a thin single length sticky tape down the front (no longer sticky)- which you only see when the tin is turned to the light - but again not disfiguring. 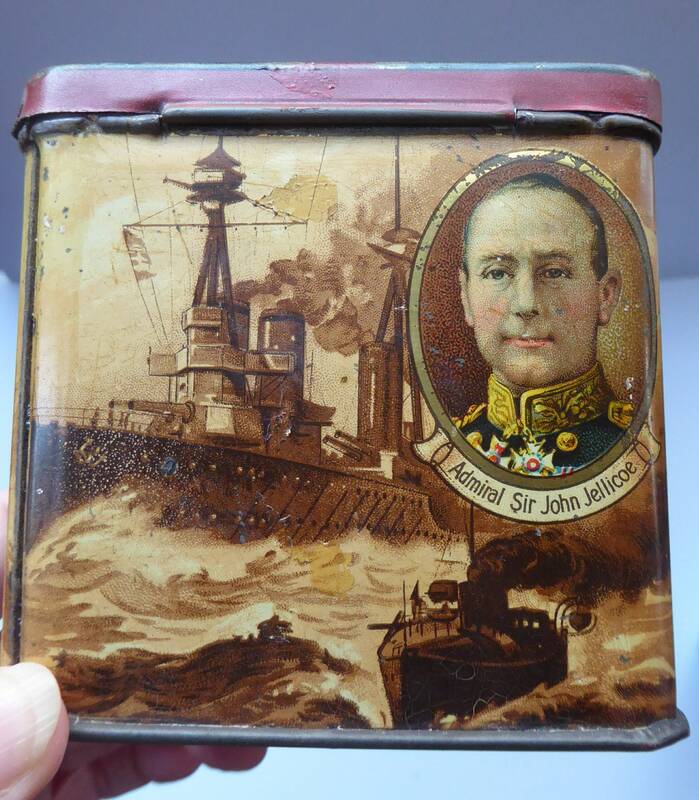 The image on the back shows Admiral Jellicoe - and battleships behind him. This image is pretty good condition. On each of the shorter sides are images of two British Red Cross Nurses; and images of Baden Powell's Boy Scouts. These are again fine and scuff free. 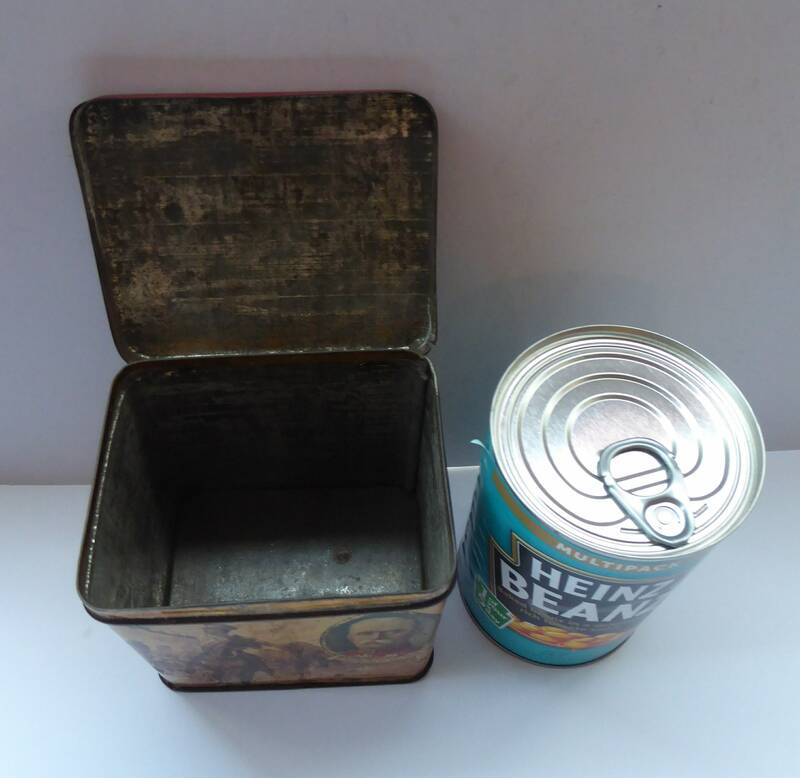 The inside of the tin is a dull metal colour - with the tin oxidising (as you often find) over the last hundred years. The base is also the same tone. 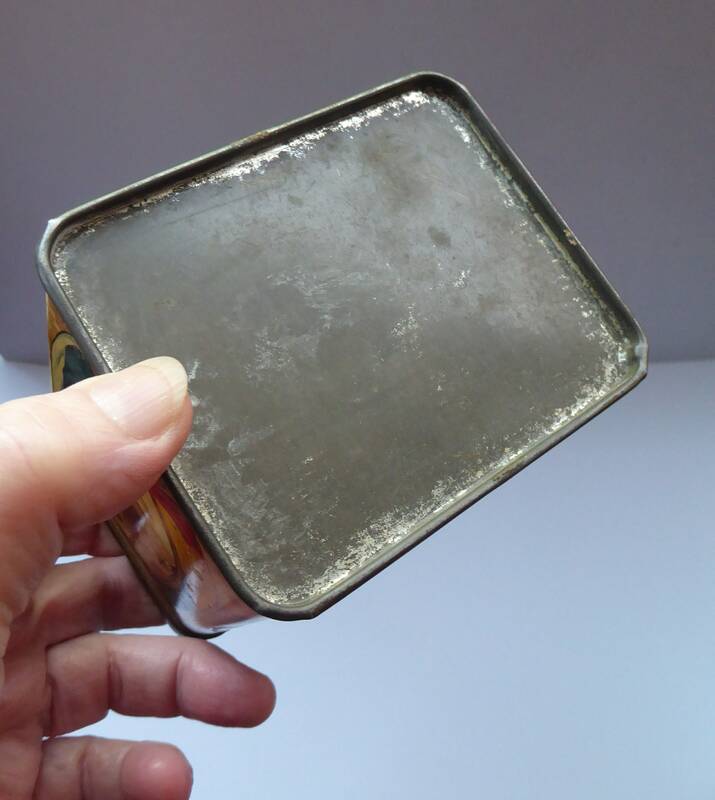 There are no dents or breaks in the metal - no rusting - and the lid is still hinged and opens and closed easily. 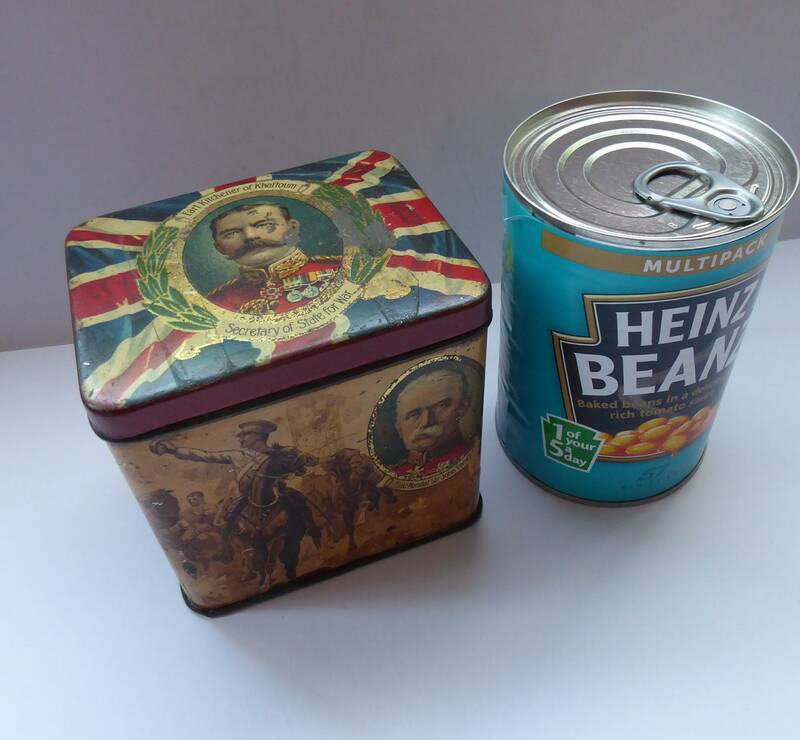 The tin measures: 9.5 cm in height. It is 9.5 cm wide and has a depth of 7.5 cm. This is a very fine and sought after Great War souvenir - these were only produced for a short period of time at the start of the war when there was still a certain jingoism and celebration of the fighting - and before the carnage dragged on and on relentlessly for years. We are happy to take payments via Etsy, Paypal - or if you do not have an electronic finance account - we are delighted with an old-fashioned cheque. If you have any payment issues or inquiries, then please get in touch with me and will be happy to help you. At IconicEdinburgh, both Robert and Valerie strive to move your orders forward for you quickly. We try to post out the day after receiving payment from you wherever possible. Any delays with us posting out to you and we will get in touch via email or official Etsy Convos and will keep you fully updated on progress with your order. WE ARE HAPPY TO POST OUTSIDE OF THE UK - but as prices vary internationally we do not offer a standard charge on all of our listings. Again, we always try to get the best postage cost for you internationally - so please just ask for a postage quote for outside of the UK. WORLDWIDE POSTAGE. All parcels are fully insured and tracked - but customs would be the responsibility of the buyer outside of the European Union. All postage prices quoted on our Etsy listings are in the main for UK delivery, and again tracked and insured for item safety. For smaller items to the UK, we use Royal Mail 2nd Class Recorded services to try and keep your postage costs down. For larger and heavier items we will Parcelforce48 and try to get you the most affordable postage quote - for tracked, insured and signed for service. The shipping price quoted is for postage costs PLUS a little extra towards Etsy shipping fees, our own packing time and materials. We try to give you the best shipping rates we can - and certainly, do not make profits from posting to you. Where you have paid significantly too much on shipping fees - ie for combined item shipments - we will be delighted to refund excesses to your account. We have a very fair refund policy on anything sold to you. All our items are sold in excellent vintage condition, any issues with an item are photographed for your inspection and pointed out in the description. If an item is damaged in transit to you - we take full responsibility - and you get both the cost of the item and your postage costs refunded by Iconic. ***GOODS DAMAGED IN TRANSIT*** Please supply us with images of all damages - these shoud be clear and where possible relate to images on the item description. Also it is imperative that you KEEP ALL PACKAGING UNTIL CLAIMS ARE SETTLED. We will request that you also send us images of the packaging - any external damage and the internal packaging etc. Please note that without details of the packaging our courier companies will refuse any claims for damages. Many thanks. I will take up all claims on your behalf when I have been provided with the requested images etc. Basically - we are not in the business of making anyone unhappy with their purchases and we strive at all times to make everyone 100% delighted with items that they buy from us, and that they arrive with you as described and photographed. Please see our excellent feedback from happy customers. We pride ourselves on being responsible sellers with over a decade of trading experience behind us in our Edinburgh flagship store (as well as a lifetime of both being collectors!). We always include our address for returns with any order, and we have a good online profile developed over many years in trading in Edinburgh and online. PARCELS LOST IN THE POST: We send all parcels tracked and signed for. This is for your own safety. If an item gets lost in the post, then we have to follow Royal Mail guidelines as to when a parcel is deemed by them to be lost. For UK deliveries: we will consider your parcel as lost after 10 WORKING DAYS after proposed date of delivery; at this point, we personally refund you ourselves. For international deliveries we will consider your parcel lost as follows: for EU parcels this will be after 20 WORKING DAYS, and for the rest of the world this will be 25 WORKING DAYS. If your parcel is a little late - please try and be patient - sometimes a parcel gets delayed in the post - and although we can sympathize with the nuisance of postal delays - once a parcel is out of our hands we are quite restricted in what we can do to hurry it along for you. We apologize in advance when delays happen - but we always pay for a quality delivery service for you and are certainly unhappy when your parcel gets delayed. We always post out promptly to you. If it appears that you have simply changed your mind about your purchase after we have posted out - we would have to request that you agree to pay for all postage costs, especially if there are no actual issues with the condition of the item on receipt and it arrives with you just as described and as shown in our photographs etc. 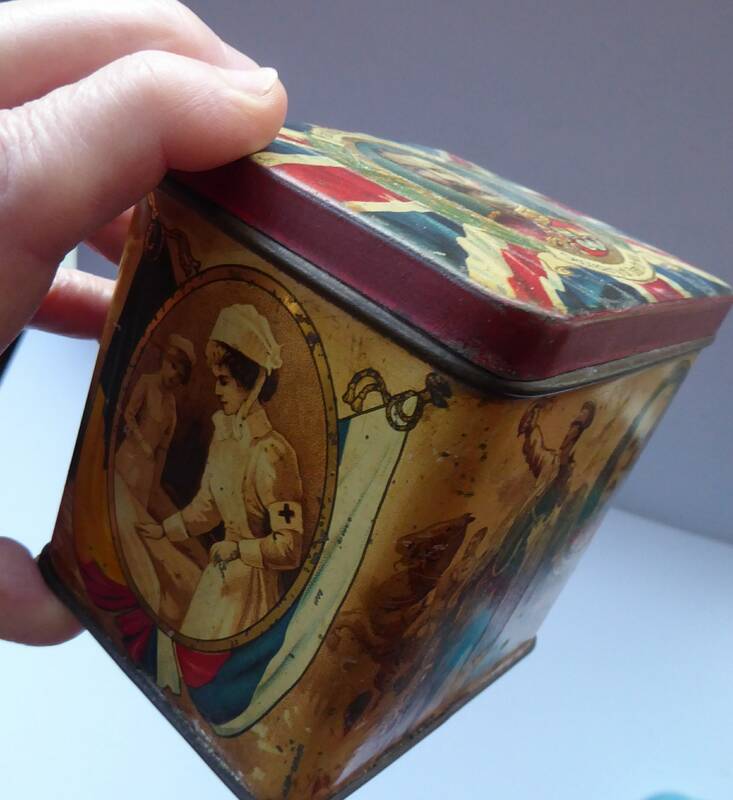 If you would like further photographs for you to fully assess the condition of an item - please ask for more images of specific areas to be sent to you before you commit to the purchase of an item, and will help satisfy that you are happy with the condition of the item to be sent to you. All our items for sale are quality vintage items - we try to source items which are in excellent condition with no damages. But where something is very rare, we shall occasionally list these - but any major condition issues will be clearly described for these pieces. PLEASE ALSO CAREFULLY CHECK THE PHOTOGRAPHS POSTED - AS THESE ALSO FORM PART OF MY DESCRIPTION. As vintage items - you might expect to find minor scratches or blemishes commensurate with age and use of the item, or indeed which have occurred in the manufacture - but any major faults or issues will, of course, be pointed or photographed for you. Do you post items internationally? IconicEdinburgh ARE HAPPY TO SHIP TO YOU WORLDWIDE - JUST ASK FOR A PERSONAL POSTAGE QUOTE FOR YOUR LOCATION AND ITEM. As parcels are charged by weight there is often variations in costs for international shipping. We are happy to provide a personalised quote for your items. We use Royal Mail signed and tracked for postage - and make sure all items are fully insured in transit. Any parcel over 2kg in weight might prove to be expensive to post; especially to the Americas, Australia and the Far East - but happy to search for the best shipping quotes and services for you. What happens if my item is lost or damaged in the post? IconicEdinburgh make sure that we pack up your parcels properly and with care and use sturdy boxes and plenty of bubble wrap to keep safe in transit. We hardly ever have any problems with items getting broken in transit - but we take full responsibility for any damages in the post. We always use signed and tracked for post. If an item is lost in transit - again, we take full responsibility for your loss. The Royal Mail sets down guidelines on determining when an item is deemed lost in the post - and at such a date we would fully refund you personally the cost of the item you purchased as well as your posting costs. We only want happy customers - so will work with you to resolve any issues to your satisfaction. Do you take part payments or offer lay-away facilities? But if you are seriously interested in an item, I am happy to keep items aside on reserve or hold for you for agreed periods of time. Please feel free to enquire about this option. Do you offer discounts on your prices? All our items are priced at fair market values and many of our items are often rarer pieces and quite difficult to source. We also have to pay nearly 15% of our the stated price in selling fees and charges to Etsy for each transaction. Sadly, we DO NOT OFFER DISCOUNTS on our stated prices, sorry about this - our best price is the one stated on our listing. We regret that due to often protracted communications and some rather cheeky discounts being requested - any approaches with regard discounting our prices will not be answered. Sorry about this but nearly every second question we get relates to requests for high discounts and low best offers being submitted. Thank you for your consideration on this delicate matter. How do I buy items on Etsy? What Shipping Companies do you use in the UK? For parcels under 2kg in weight, we use the Royal Mail tracked and signed for service. For heavier parcels over 2kg, we use Parcelforce48 (always tracked and signed for) and try to find the best shipping deal for you to keep your shipping costs down. The Royal Mail Parcelforce postal service is perhaps a little more expensive than other courier companies - but offer you the opportunity for a pick up from a Royal Mail depot if an attempted delivery has been made and you have not been in. We often under-quote shipping costs for Parcelforce and top up for you any required postal tariffs. What do I need to do if I receive a damaged item? If an item is damaged when you open your parcel, you must get in touch with us straight away so that we can take your claim forward for you. To assist us in claiming for damages on your behalf you MUST provide us with a number of images of the damage. You must also provide images of the packaging we have used - the exterior of the box and all the internal packing that we have used. PLEASE DO NOT DISPOSE OF THE BROKEN ITEM OR ITS PACKAGING UNTIL YOUR CLAIM IS PROCESSED. The courier company may wish to inspect these. Sadly, if you cannot provide any images of the damage or packaging, it will invalidate any claims or refunds for the damage. Rest assured that I will do all I can to take claims through for you promptly and without fuss.